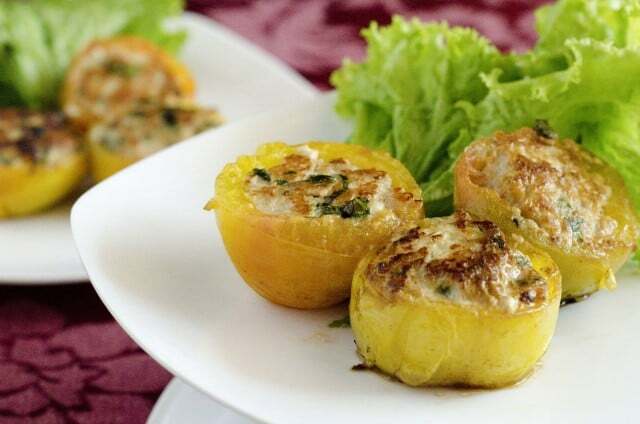 Home › Creative Creations › Cambodian Stuffed Tomatoes–An Asian Delight! Cambodian Stuffed Tomatoes–An Asian Delight! Ever wanna try a new Asian cuisine but can’t afford the pricey Thai restaurant downtown? Try this one to WOW your hubby as well as please the American-only cuisine lovers. This dish is Asian, but definitely has some Western similarities. Serve it with Jasmine rice to get the full effect of a traditional Asian meal. No, you cannot substitute Uncle Ben’s rice! Most of your local grocery stores carry Jasmine rice. Looking for more Asian recipes? Try this one. Cut tomatoes in half and remove all pulp. Turn cut side down onto paper towel and let drain. Next, combine pork with all seasonings and mix with hands until all seasonings are thoroughly incorporated. Now, stuff each tomato half with about ! tablespoon of the pork mixture. Then, add 3 tablespoons oil to a large skillet and heat on medium-low heat. Place stuffed tomatoes open-side down into pan and cook for about 15 minutes or until tomatoes have softened a little. Then, flip onto other side and continue cooking an additional 10 minutes. Do not cook too fast because the pork will not be cooked thoroughly. Both sides of the tomatoes need to be heated to thoroughly cook the pork. Makes 20 stuffed tomatoes.